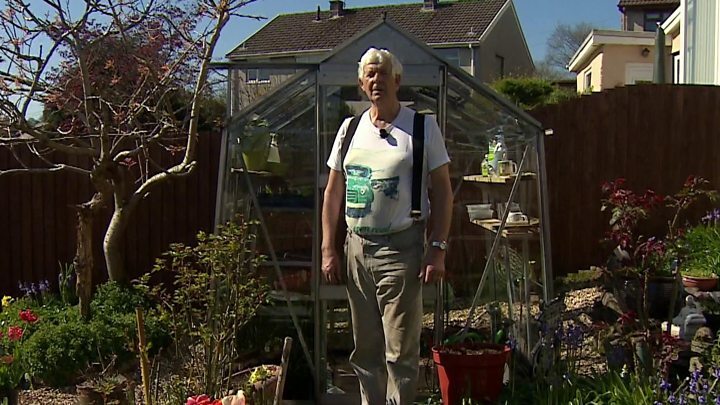 Media caption"There's so many loving and caring people out there"
He received offers of help, replacement equipment, plants and seedlings after the "inferno" in his back garden at Tonyrefail, Rhondda Cynon Taff. He is well known for broadcasting from his allotment on Jeremy Vine's show. And a crate of beer turned up on his doorstep, presumably to help "drown my sorrows", he joked. But he was not down for long. "Parcels started turning up out of the blue," said Mr Walton, 73. "I was overwhelmed with the numbers of people helping out." Image caption Only the aluminium frame survived among the "charred mess"
"It was a charred mess," Mr Walton said. "But then help started coming from everywhere. "I couldn't believe there was so much love and care out there."